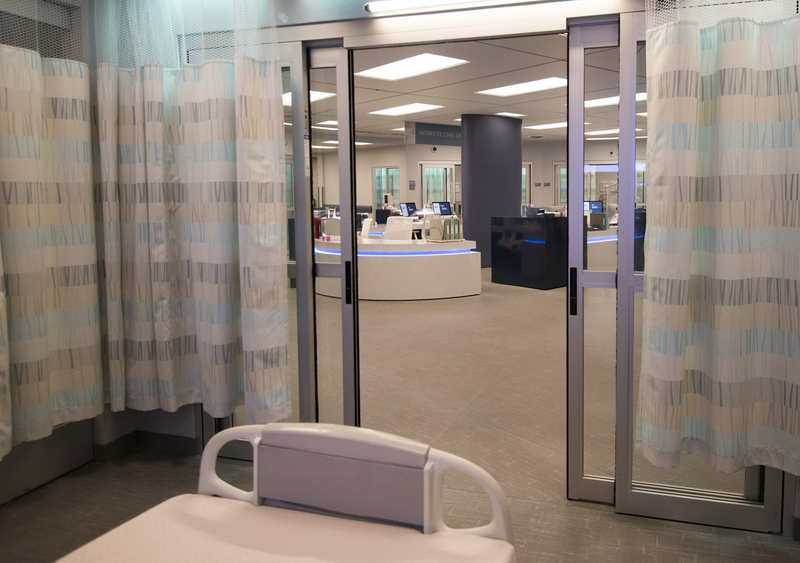 Designing for a show set in the fast-paced world of a major metropolitan hospital gives production designers a unique challenge: balancing medical accuracy with the ever-changing needs of a medical drama. Stemming from a “Chicago Fire” backdoor pilot episode, “Chicago Med” starts with the opening of a brand new portion of the fictional Gaffney Medical Center — after much of the previous building was destroyed by an explosion. 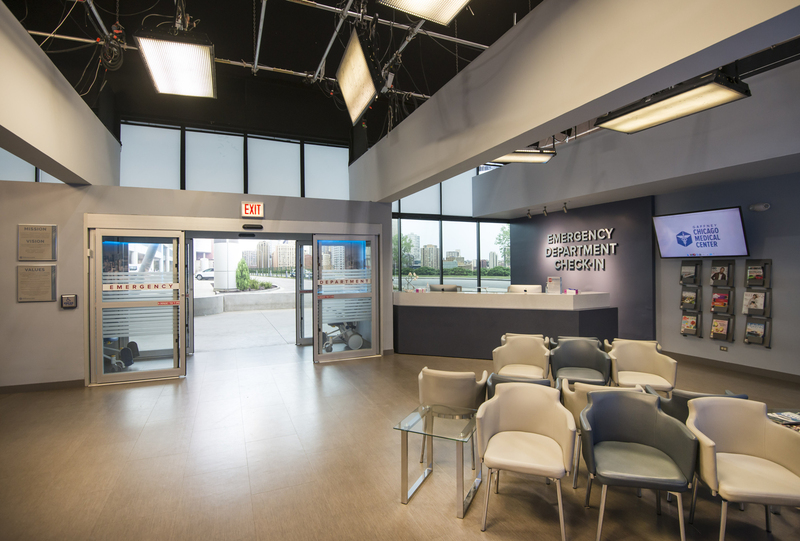 Because of that, parts of the set, including the emergency department, surgical suite, intensive care units and psychiatric area feature innovative, modern design built at the Cinespace Chicago studios along with its sister shows. The fact that sets are packed with state-of-the-art medical equipment is just the start of this look. Gaffney’s production design team and props department opted to outfit the space with futuristic white and blue wheelchairs, tablet computers and plenty of built-in technology for patient services and comfort. 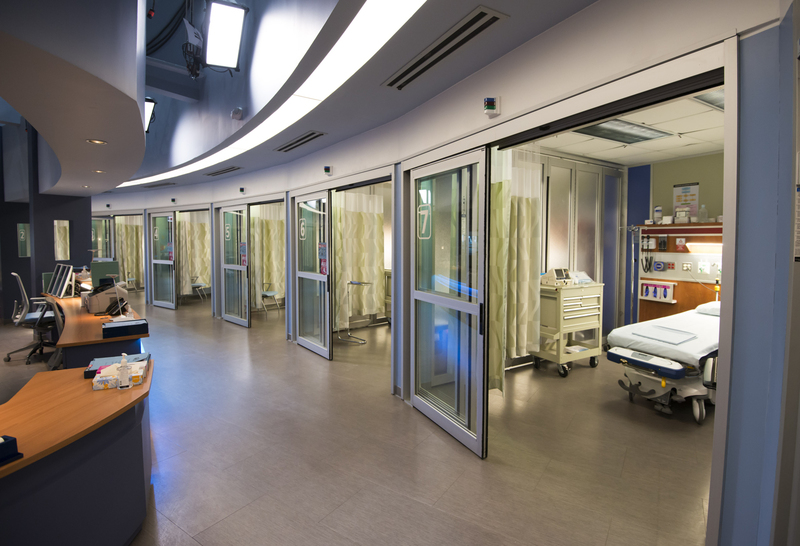 The infamous ‘Baghdad’ trauma bay on the ‘Chicago Med’ emergency department set — its name comes from the fact it is used for the most serious cases. Gaffney Medical Center’s architecture is loosely based on Chicago’s Rush University Medical Center, located in the city’s medical district, which is also used for location shoots for exterior scenes and to take advantage of the stunning views of the city from the rooftop of the building. 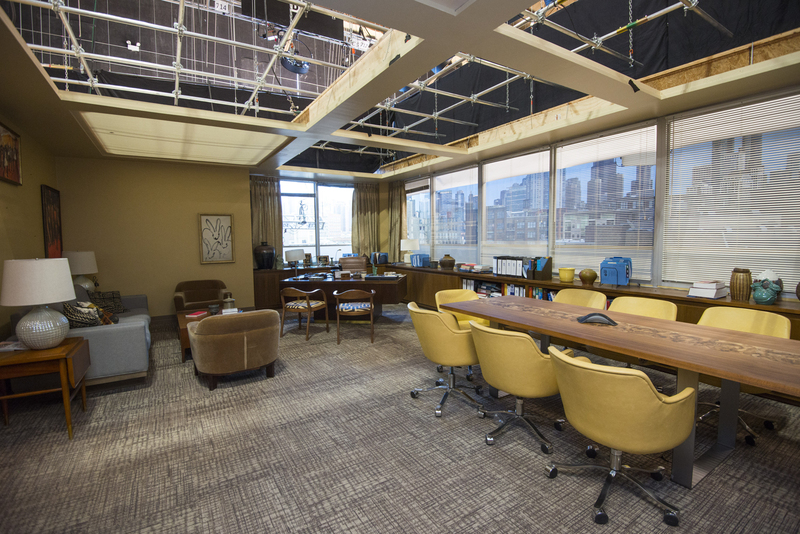 The show’s production designer, Lori Agostino, was brought in while the first episode was being filmed — and was immediately tasked with making some quick changes. “My challenge was actually to take the set that was already partially built and redesign it into the current set you see today,” she explained. 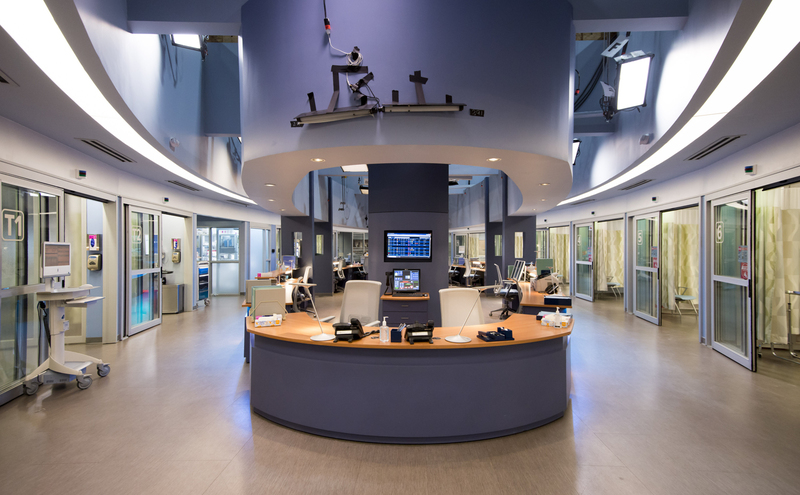 The emergency department set’s curved radial walls are a key design element in many other ‘Chicago Med’ sets as well. Thankfully, Agostino is a big fan of curved, radial walls. Since the emergency department’s set already had 95-foot long ones that were built from steel, changing them wasn’t realistic — especially given the five-day turnaround she was given. Those walls, flanked by treatment rooms and other work and break spaces, remain a key element of the layout to this day despite set updates throughout the seasons. 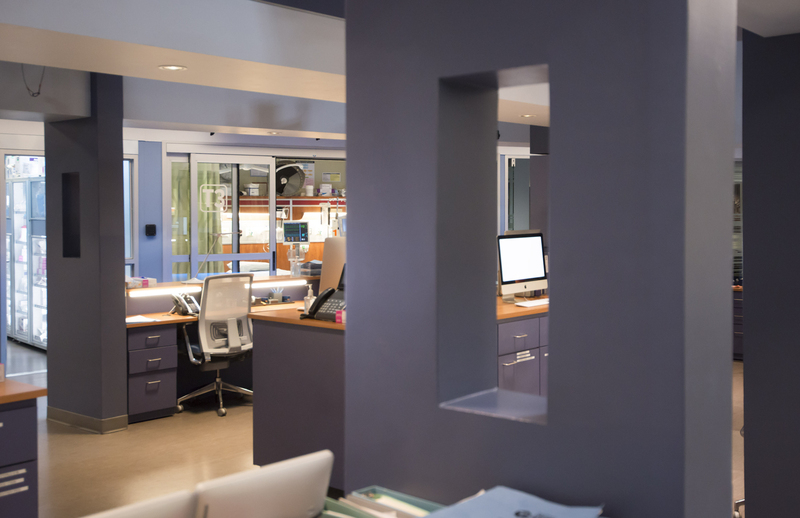 The ‘monolith’ at the ‘Chicago Med’ emergency department nurses’ station was added while the first episode was shot is designed to play key role in both the foreground and background of scenes. With a goal of making the set more functional, Agostino started by adding a large “monolith” in the central nurses’ station. This plan allows another character to be checking patient files on one of the computer terminals on the outermost ring of the nurse’s station, while still being able to get interaction or rack focus shots between someone working in another area of the station. Glass — both transparent and textured translucent panels — plays a big role in this layering and interactivity, and much of the glass on the set pivots to allow the lighting and camera crews to get the best, well-lit shots with annoying glares or reflections. In what she calls a “completely counterintuitive” move, Agostino also lowered the ceilings of the emergency ward — a strategic design meant to symbolize the pressure of working in a space where life and death happen day in and day out. “It creates a design compression … and adds to that feeling that you’re surrounded by action,” she explained. To this day, the ED still remains one of Agostino’s favorite sets. 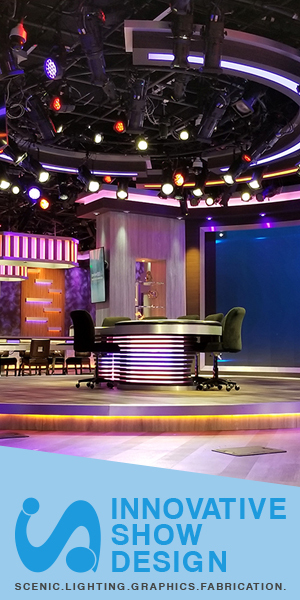 In a process she calls “designing backward,” she’s always being challenged by expanding and changing the set for the needs of the show while still keeping the look consistent. Agostino hasn’t let the hospital sets stay the same, however. In Season 2, she updated the Ambo bay — medical jargon for where ambulances pull up and discharge patients — and the following season saw an update to the lobby, elevators and hallways. 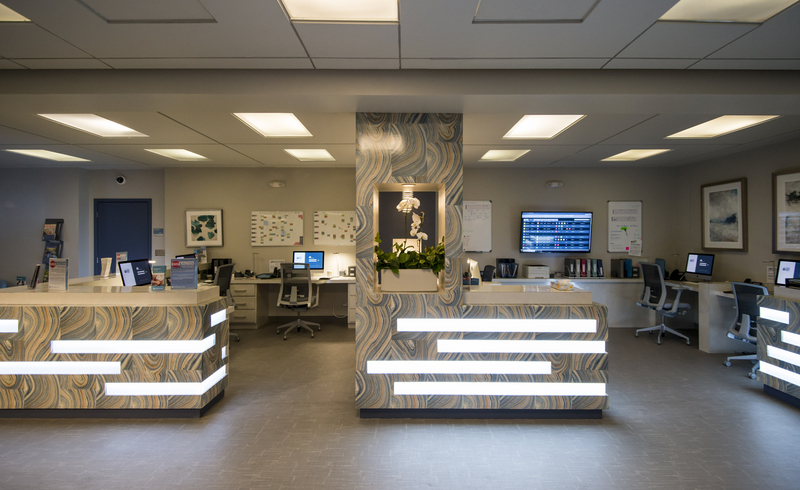 The ‘Chicago Med’ emergency department lobby and waiting room set was one of the sets that saw updates as seasons went by. “In real life, everything is in constant flux and I believe sets have a life of their own and should constantly move with the times,” Agostino said. “The changes can be subtle or extreme, but the viewer usually isn’t aware because we shoot in such a way that allows me the freedom to change while keeping the overall look consistent,” she added. To ensure that medical procedures are portrayed realistically, there is an in-depth medical meeting for each episode. Every set that Agostino designs is researched on many levels. “I tend to look into state-of-the-art design since our hospital should be cutting edge. There is also a change in the attitude of design for hospitals which make them seem a little more like hotels which is in keeping with a new attitude to healing in America,” she explained. 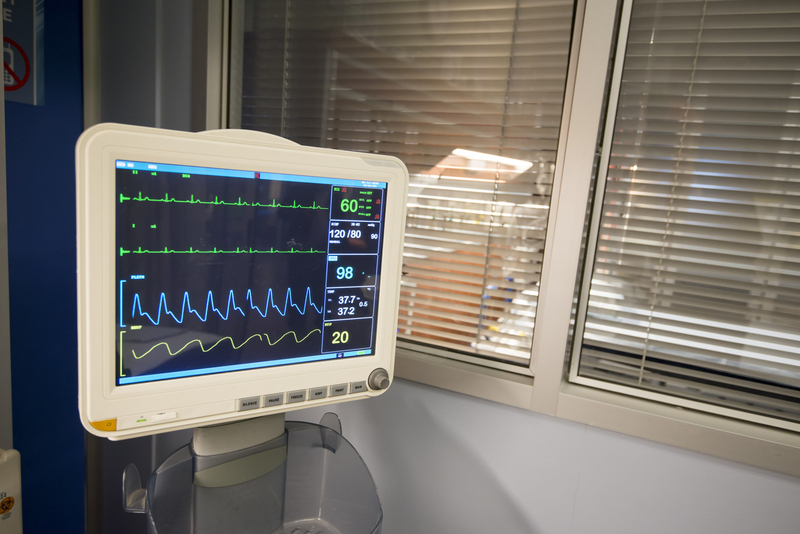 All of the medical equipment on the set is actual equipment, but the show rewires it to allow control of, for example, the vital status shown on a monitor or control indicator lights. Sound effects such as alarms can also be added as well. This screen, which is real medical equipment, has been specially wired, like the others on the ‘Chicago Med’ set, to show video playback simulating a patient’s vital signs. For equipment with screens, the production design relies on a video playback team that creates graphics that can be fed to the monitors to reflect patients’ conditions, scans or medical records as the plot demands. Even the mobile computers scattered throughout the emergency room are specially rigged — hitting any combination of keys on the keyboard automatically enters the username “nurseadmin” and a masked password before bringing up a faux medical record. With the help of the show’s medical consultants, the meetings include a detailed overview of all medical procedures to take place on screen. Careful consideration is taken as to what will be seen or heard on equipment. Next, the medical tech team researches actual images that one would see on medical monitors, which are added to the custom-created playback. “While the equipment is background, it is quite a process to make sure that everything is correct and goes through many prep stages to get what you see on screen. Because of this every piece of equipment is real and functions correctly, albeit rigged for camera,” noted Agostino. 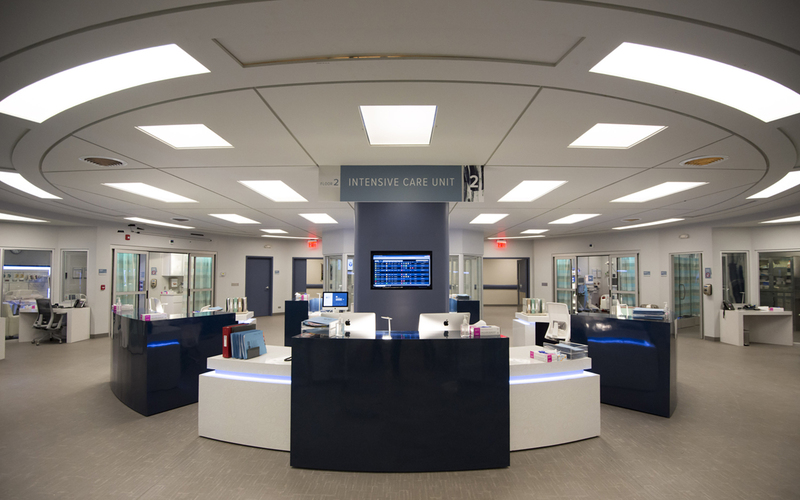 In addition to the emergency room set, Agostino also created numerous other areas of the hospital — including an interchangeable ICU set, surgery suite, psychiatric ward as well as office spaces — all of which rely on unique color schemes, finishes and lines to present unique looks that give viewers subtle clues to where they are while still tying together the design. Take the ICU set for example. Thanks to interchanging signs, privacy curtains and wall coverings, it can be converted to a pediatric ICU meant to be a completely separate part of the hospital. “I started playing with the idea of Yin and Yang and suddenly I had a set that was round, which you find quite a bit in ICU design, as it’s built around the nurses’ station,” explained Agostino. Conveniently, the curved lines mirror the radius walls found in the ED set. Agostino reused some existing doors, which required straight walls, so that lead her design exploration into working with straight lines within the round structure. “It was also important to me to design a set that the camera would love, which means that anywhere in that set you can see layers of texture, meaning that if in one patient room, you can see all the way across the set to the other side, which is beautiful for shooting as it gives directors the ability to get textural shots in their frame which always makes for a more dynamic scene,” she explained. Although the psych ward uses more straight lines and right angles, it does include this curved wall that’s a nod to the radial elements found on the other hospital sets. She also incorporated the radius, albeit subtly, into the psych ward, where here it’s more of a design feature than a wall, opting instead to use a mix of wood textures and bright, indirect lighting to create a modern take on mental health treatment. During her research, Agostino discovered there had been a drastic change to mental health facilities that seems, at least partially, inspired by the relaxation of a spa. The design in this area is more focused on calming colors and tones as well as architectural elements that embraced a more naturalistic feel. 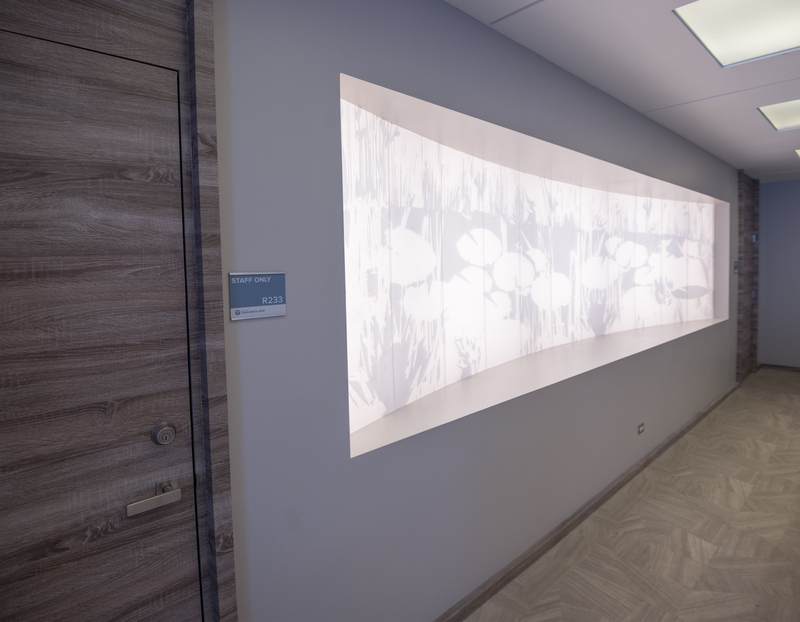 “I placed a curved light wall with images from a lake on faceted etched glass that glows in the reception area, which is one example of the new design standards for mental health. I also incorporated the storyline into the design, as it was a wing that was donated by Dr. Rhodes’ father, who owns a high-end department store, so there was a sense of elegance that he would demand for his money,” she explained. Meanwhile, the operating floor sets are much more linear, as Agostino felt the symbolism of the rigid processes of surgery dictated the need for more straight lines and right angles. In short, every piece of Gaffney is related but also distinct, a must, given the high usage the hospital sets see. Unique design elements in each area are a silent but highly visible way to let viewers know the setting has changed. Early in the design process, the design team decided Gaffney Medical would rely on blue as a “brand standard,” so some shade of the color finds its way into all of the sets — although in some places it’s more subtle. 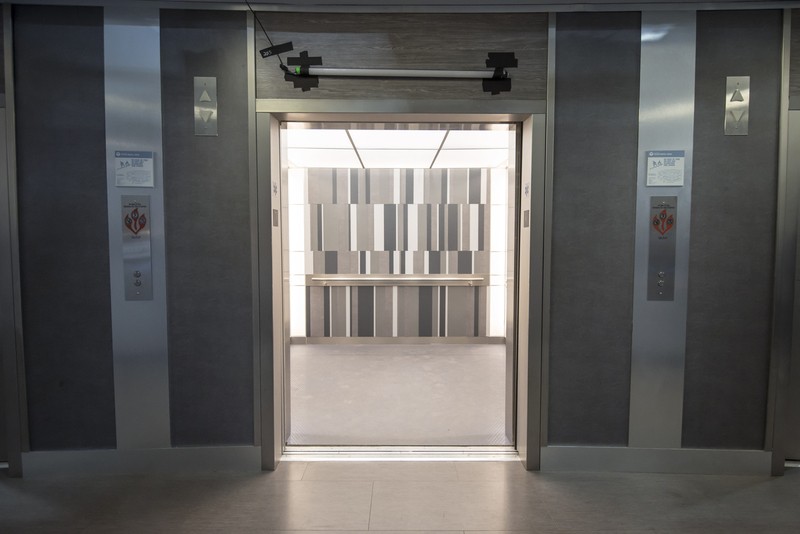 The faux elevator just off the emergency department set uses a bold geometric pattern in shades of gray and white. “Most of the colors are custom mixes that I will take from something I find and give to the painter to recreate, who does a fabulous job. We then use them as the color bible and add to it, without going too far outside only because hospitals are pretty consistent with their colors,” said Agostino. Mixed in with the blues are other cool, neutral tones, grays, and other complementary colors as well as textured wall coverings. Along with a design’s lines and shapes, color plays another key role in helping give viewers visual cues as to where the scene is taking place. Although the color palette is bit limited thanks to both the Gaffney brand and the need to stick with a calm, soothing palette, most areas of the hospital sets have a variation of the base color scheme in everything from the rooms to hallways — often with a pop of another element. Calm, soothing colors are used in the intensive care unit set. 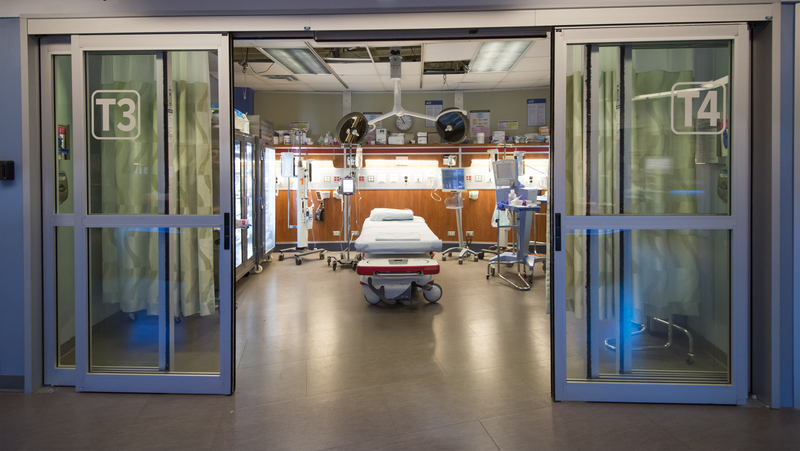 Since the set doubles as both a traditional ICU and pediatric ICU, colors and texture changes are used to make it look different and give viewers a visual cue to the setting. In addition, textures found in wall coverings or decorative wall panels also give different zones of the hospital unique visual cues — such as dramatic white and black panels found in the ICU or playful, colorful motifs in the pediatric areas. Texture is another key way that various areas of the hospital are delineated. Gaffney also has a VIP ward swing set — one that’s not kept up all the time and may only be used for an episode or two. This set, with a unique faceted design and specially designed nurses station, stands out for Agostino. “VIP wards in hospitals are quite something, the research was amazing for that set,” she said. Although to the casual viewer the modern look of Gaffney may not seem like the iconic architecture Chicago is known for, Chicago is actually the birthplace of Modern American Architecture. “Chicago architecture is not just the Wrigley Building,” Agostino pointed out. 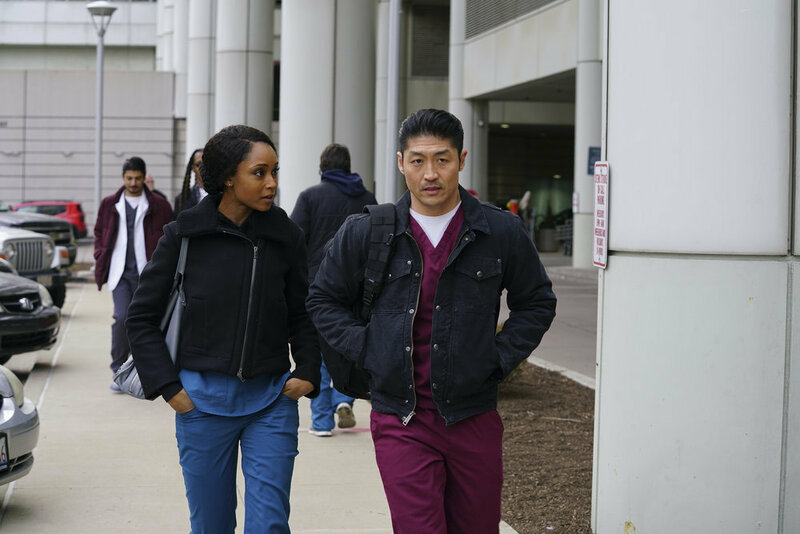 Yaya DaCosta as April Sexton, Brian Tee as Dr. Ethan Choi, appear in this scene shot on location at Rush Medical Center in Chicago. Photo courtesy Elizabeth Sisson/NBC. Used frequently for “Chicago Med” on-location shooting, Rush University Medical Center’s iconic towers, which sit along Interstate 290, echo many of the design principles Agostino uses — from the curved arcs found in the upper floors to the straight lines found on the lower levels. Agostino’s sets, which include small faux outdoor areas that mainly only appear in the far background, also include finishes that mirror Rush’s exterior, such as the white paneling and V-shaped support beams. Said to be in the “older” part of Gaffney, many of the hospital’s administrators and doctors have offices branching off from warmer, brown and tan hallways. Agostino especially enjoyed creating Chief of Services Sharon Goodwin’s office. Played by “Law & Order” alum S. Epatha Merkerson, the personality of both Merkerson and her character shines through. “Epatha has a great art collection, so I had her photograph her work at home and then found artists who had the same feeling,” explained Agostino. The show also worked with a painter friend of Merkerson’s and hung a replica of his work on one wall. Coincidentally, Merkerson recently bought some lamps for her home — only to realize they were actually the same lamps Agostino put on her office set. “I love that design osmosis that happens. I consider her whole set a little gem!” said Agostino.